Matkatoimisto Aventuran vaellusmatka Annapurnan ympäri syksyllä 2014. Sekä maisemiltaan, että kulttuuriselta anniltaan huikean monipuolinen vaellus on suosikkini Nepalissa. Aventuran 11-päiväinen ohjelma on vuosien varrella hioutunut täydelliseksi ja ajankohta syys-lokakuun vaihteessa on erinomainen. Sääolot ovat vakaat ja näkyvyydet hyvät. Laaksossa korjataan lisäksi satoa syys-lokakuun vaihteessa ja tapaamme polunvarsilla paljon paikallisväestöä. 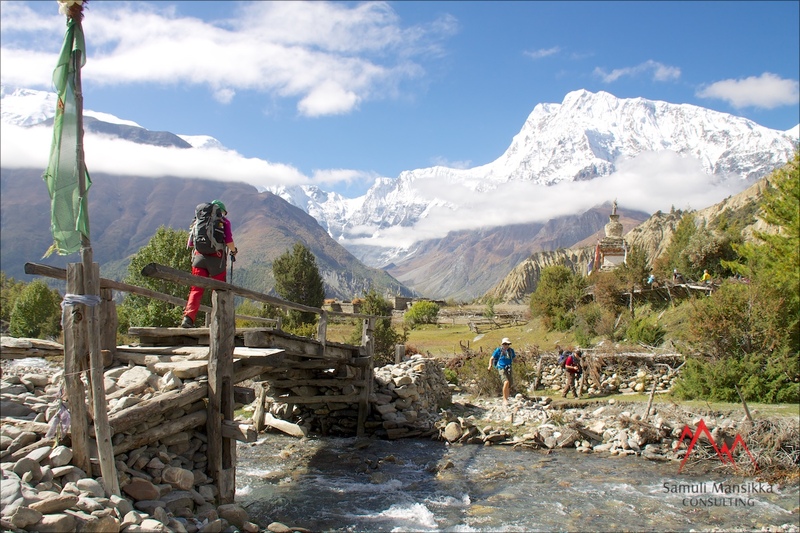 Aventura Tour Operator’s Annapurna Circuit trek in Sep-Oct 2014. Scroll down for tweets sent from the trek (in english)! Back at my second home town, Kathmandu! Starting Annapurna Circuit trek tomorrow as driving to Syange-trailhead! Follow also on Instagram! Have trekked two days on Annapurna Circuit and arrived at Danaqyu (2300m)! Weather’s been amazing. Due to big monsoon very lush and green! Have entered Manang valley! Starting to see more snowcapped peaks as moving to North side of the Annapurnas. Follow also on Instagram! Another fine day on Annapurna Circuit as we took the high trail from Pisang to Nawal! A stunning section with great views to the Annapurnas! Milarepa was 11th centuri Tibetan poet,yogi and sorcerer practising black magic and levitation. Visited site near Manang where he meditated! We’re entering high-mountains as get closer to Thorung Phedi. Got to Yak Kharka (4050m). Many blue sheep on the way and magnificent views! At Thorung Phedi, 4540m. A stunning place surrounded by cliffs and views over Gangapurna (7495m)! Crossing Thorung La to Muktinath tomorrow! Aventura’s Annapurna Circuit group has now arrived in Muktinath after having crossed Thorung La (5416m.)! What a splendid day we had! Whoa, what a windy day trekking through Kali Gandaki river gorge to Jomsom! Stunning landscape though! Trek now finished! Fly out tomorrow! ’Gotta love Pokhara after a long trek around Annapurna! Time to chill out and enjoy the lakeside-city! Next trip up – Annapurna Basecamp!